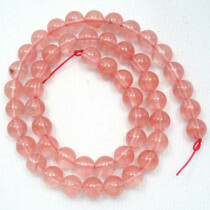 These pretty semi-transparent pink beads show internal clouds, swirls and needles of a darker pink hue. 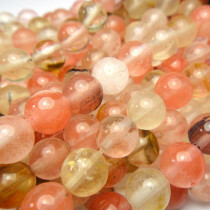 Not actually a gemstone at all, but a specially processed glass with similar optical properties to quartz. 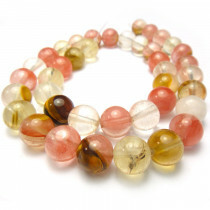 Any properties believed to be associated with Cherry Quartz are related to its colour which can lift energy and spirits and add passion to everything one does. 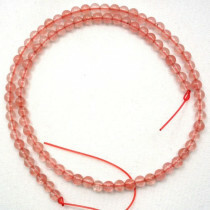 Cherry Quartz glass Round 4mm (~100pce Strand) - 40cm /16'" Strand. 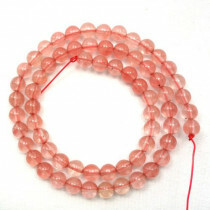 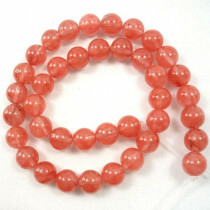 Cherry Quartz glass Round 8mm (~50pce Strand) - 40cm /16'" Strand. 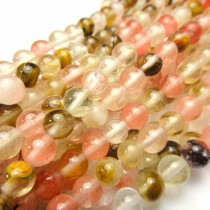 Mixed Colour Cherry Quartz Round 8mm Beads (~50pce Strand) - 40cm/16'" Strand. 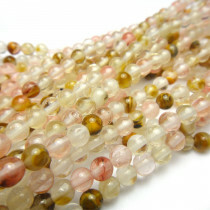 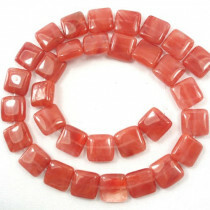 Mixed Colour Cherry Quartz Round 10mm Beads (~40pce Strand) - 40cm/16'" Strand.